I don’t know where to look, where to put myself, what to do. Part of me wants to get out of here, as quickly as possible, to put infinite distance between me and this huckster, mocking me with her duplicity. She’s ensnaring me. She’s offering me hope, so that she can dash it, and then trample over my upset. She’s a Trojan horse, trying to get behind my defences, so that she can attack me from within. But maybe it’s for real. Maybe she means it. Maybe she wants to help me. But she won’t, because I don’t know how she can. I don’t know how to answer her question. I am unhelpable and hopeless: a limitless emptiness of irreparability. There is no help for someone like me. That’s what I’ve known all my life. Because I am bad. All of these thoughts whirl around like spring gusts in a courtyard. I don’t know what to say. I don’t know how to be. ‘What do you need from me?’ she says again, because I haven’t responded. There’s such tenderness in her voice, like crepe paper folding itself over my heart. I am tempted to believe her good intentions. I’m tempted to hope. ‘I’m not allowed to need,’ I say, guiltily. I feel stuffed full to the lid with neediness, a vast vat of it, all sticky and putrid. My neediness is wrong. More than that, I am wrong. I shiver with the shame of it and bury my eyes into the biscuity carpet to avoid the reproach of her gaze. I can hear her sigh, but with such a weight of sadness that even across the room from her I feel it might crush me. ‘You’re not wrong to need,’ she says. Her voice is dripping with compassion, like molten nectar. I want to lick it up, devour it, take it into myself, to make her words true, to make it possible to be acceptable within my desperate, aching wantonness of need. But I smother the feeling back down again. Bad, bad, I am bad. I feel twisted up inside, nauseous at this conflict within me, wanting her approval, wanting her acceptance, hating myself, hating my need. Her head tips forward and down slightly, like she’s trying to swoop down into my line of sight. ‘You’re not wrong to have needs,’ she says again. It’s like a piercing in my heart. And suddenly I feel whisked up away into a scene from my childhood, and I lose the nowness of now and I’m stood apart from myself, out of my body, out of the here. I’ve become little, littler than little, a sobbing frantic mess, all desperate with the terror of abandonment, and this child-me collapses into a ball and out erupts the pain, the anguish, the life-draining agony of neediness unneeded. ‘Please don’t, please don’t, plee-a-ase,’ she sobs. The mother is holding the telephone, the ugly cream bulge of it heavy and threatening, the coiling, curled cable dangling like an appendage from its torso on the wall. ‘I’m phoning the children’s home,’ the mother says, stern and callous and cold and unremitting. ‘They can come and take you away until you learn not to cry.’ But still the tears come, killing her, severing away all possibility in this conflict of impossibility. ‘Please don’t, please don’t, plee-a-ase’, with hiccuping gulps of salty wetness. Stop it. Stop it. Shut up. Be quiet. Just stop it. But she can’t. She needs good mummy to save her from bad mummy. She needs her to come back and make bad mummy stop, to let her be, to quietly, sombrely put her in her room, but without this gibbering malice and rage of the snake-mother, all evil and fetid and frothing. Other mummy disappeared, in a flick of a switch, in a skip of a heartbeat, and she doesn’t know where she went, but she needs her to come back so she doesn’t have to go to the children’s home, where the monsters come in the night-time, the big oafs of men who murder the little children. She needs mummy to come back, to stop this one. But how? She doesn’t know. She can’t know. I struggle to comprehend her words. My body is jolting still with emotion, and snot is peeking out from the end of my nose. I reach for a tissue to wipe it away, shaky, forlorn, and deeply mortified. Surely this is the point at which the therapist will tell me that she can’t work with me any more. Because I am too much. Because I dissociated. Because I really, really, don’t deserve to be here. ‘How can I help you?’ again she asks. I gulp in a ratchety breath and try to force myself calm. The scene of what just played out here is like afterburn on my mind. I can see enough of it to know that it just happened, but I can’t remember it directly. I don’t want to remember it. Punished? I’m surprised at her choice of words. Was I ‘punished’? What is she referring to? I look up at her, quizzical. ‘Do you remember what just happened?’ she asks. I shrug. ‘A little,’ because that’s true. But I can’t look at her. Something rips through me. It’s unbidden and surprising. It slits open a memory like a sack of grain. Out come tumbling pellets of emotion. I’ve said it twice now, so she must have heard me. What’s her question? ‘Yes, flipped,’ I say, and I can see it, for that moment, in my mind’s eye: the terror of child-me, a preschooler, with blood trickling down my hand onto my wrist, the stinging pain of it, the fear that I’ll drip onto the carpet, the shakenness of the tumble, grit on my knees, in my palms, on my forearms. And I need a cuddle. Just so desperately, desperately need a cuddle. So I run to mummy and she flips. What I saw, of course, was her switching. The therapist is right to question the word. She didn’t flip. She switched. I triggered her no doubt with my attachment need. She couldn’t handle it. She didn’t know how to respond to it. And she switched into the rageful screamy one and threatened to send me away if I didn’t stop crying. But it was okay for her to cry, I think to myself, wistful but angry. The upset has subsided within me. I have, for this moment, dual awareness: I can hold in my mind’s eye the traumatised child, bereft of comfort and support, and I can see – for now at least – that she was me. And at the same time I know that I am here, and that I am me, and that I am sat with the therapist – the therapist, not my mother – and that I am remembering. This is a feat of therapeutic progress which has taken years to achieve. I can both be here, and remember, and I can know that I am me, and she is me, and that I am remembering being me. And yet only a few moments ago I became her. My progress is neither linear nor neat. But this time I’ve come quickly back into my adult self, and the therapist has mediated that shift. I am learning. I am beginning to be able to be me and remember being me, without switching away, out of shame, from the unacceptability of me. The therapist is making it acceptable. I have a sudden insight. ‘Yes.’ But better than that is the fact that right in this moment, with the therapist as my auxiliary cortex, I can stand back from that incident and see it. Really see it. And see it from the outside, not just be immersed by it, on the inside of it, reliving it, swamped and drowning. ‘And what sense do you make of it now?’ she asks, pushing me forwards. I feel like there are two pieces of paper, each with a heading: ‘Then’ and ‘Now’. I am lining them up in my head, side by side. The comparison will be stark. I force air out through my mouth to release some tension and I frown myself into a focused state, leaning forwards. Concentrating is hard when you’re used to dissociating. Especially this kind of thinking, when emotions are swirling hard and threat levels are high, due to the proximity of the therapist. I’m nearly shaking with the effort. But the therapist is here, willing me on, and she is safe, and I am safe, and it’s not happening now. I grasp onto the deep-in-my-guts sense of the safety of now and I dare myself to say it. The therapist is looking at me, focused too, her head bobbing slightly in encouragement. A big rush of air comes out of me as I collapse with the strain of thinking this. At one level, it is so simple and so straightforward. At another, it reeks of terror. This is treason to think such thoughts. To blame my mother at all, however graciously. To call her ‘wrong’. Not to take the blame myself. Not to be the bad one. And there is conflict inside me. Part of me wants to retract it all, throw myself on the floor, beg for forgiveness, sob and scream and cry and plead for the pain to stop. Because the pain will come now. The pain always comes if we talk back. Another part surges with anger. With the unrighteousness of it all. The injustice. The unfairness. The cruelty. The hurt. Another part wants to run away, to drift into oblivion, to not know, to not feel, to not be. Anything other than think about this, feel these feelings, be here. And yet another part wants to vomit with dread. Helpless, frozen, legs all collapsed under us. I sit in the conflict, twisting around within myself. I lose contact with the therapist, with the now. ‘What do you need from me?’ she says again. Again. Why can’t she just let it go? Why does she keep foisting herself into me, invading me, coming where she’s not wanted, intruding where she’s not needed? I don’t need anything from her. I don’t need anything from anyone. But then I sit across from myself as I feel the sobs begin to rise. Acceptance, I think to myself, but don’t say it. I need you not to reject me. Not to shame me. Not to punish me. Just don’t send me away. Don’t humiliate me. Don’t ignore me. Just sit with me. Hold my hand. Tell me it’s okay. Wipe away the blood and put a plaster on it. Tell me a story of when you fell off your bike. Ask me what happened. Say you know it hurts. Ask me to show you where. Tell me I’m being brave. But I sit, as these thoughts swarm within me like a thousand angry wasps, and I say nothing, and I can’t meet her gaze. I’m too ashamed still. ‘You were only a little child,’ the therapist retorts, kindly but firmly, searing into me with compassionate eyes that won’t let me discount it all. I sigh, frustrated, and turn away further. Really I want to escape now. ‘Receiving anything from anyone is hard for you, isn’t it?’ she says. And then it comes. Erupt and away. ‘You’ve looked after yourself extremely well. You’ve coped through very difficult circumstances.’ She’s trying to placate ‘him’, trying to bring him onside, trying to mitigate the conflict that he wants to stir between us so that we can avoid these feelings that are steaming on the surface. A long pause now as the words fizzle away and I gulp some air to try to calm myself and I try to come back into me, into just me, and to stuff down the vulnerability of this rancorous part, so frightened and disavowed. The therapist picks her way through the minefield I’ve just set for her. She guards the way with warmth and connection and humanity and realness. Yes, that’s about right. In fact, that’s about perfectly, completely right. I soften my ribs and sink a little into the chair. There’s a bit more space for air in my lungs. My fists uncurl. I nod, because I’m not sure what sound I might make if I speak. It’s an olive-branch. In a tight, closed-up space in my mind is a little bubbling of resentment, that she didn’t agree to meet all my needs, all the time, and forever. But her limitations at least feel safe. The boundary of what she can and cannot do feels safe. She is offering a transformative experience, within the confines of ‘something’, rather than ‘everything’ or ‘nothing’. That is largely alien to me. But its compactness feels safe. She puckers her lips into a thoughtful gaze and chews on the idea for a moment. I look at her, suspicious. I don’t want to be fooled by the seeming profundity of what she’s just said. And I don’t want her to see that something is resonating, deep in my guts. I want to think about this, and mull it over, and consider it. I don’t just want to take her word for it. I want to know that it’s right. She smiles at me, perhaps sensing my struggle. But it’s the end of the session, and I have a sense, as if she’s about to pick up the phone. And so off I go to sow. I never comment about anything online, but I was drawn to read this blogpost and was so moved that I have to tell you how useful it has been (not to mention beautifully written). The idea that therapy isn’t everything, but it’s something, is one I will definitely use in my client work. Thanks! Feeling huge emotion reading this. Revisiting my own childhood and my experience as a mother. Very moving and thought provoking. Thank you. I want to say more but right now I cant find the words. It is so reassuring to read something that I relate to so much, that perhaps I’m not alone in my thoughts whilst sat with my therapist. Thank you. But there are an awful lot of places in this adult world where needs and emotions aren’t welcome. Church, social services, family, friendships. It confuses me. I am all or nothing, needs are ok if they’re ok…. everywhere. And they’re shameful if they’re not ok.. everywhere. I get in a muddle. This couldn’t have come at a better time. I’m just about to go into a session with a client where I truly believe this insight could be transformative. I have never explicitly expressed that I what I can offer is not everything (despite my clients verbalised wish that it could be), but at least something. The analogy of a seed is simple yet powerful. Thank you. An excellent piece of writing very emotive and I can relate to the cruelty of not being comforted in times of need by my attachment figure . I have had a light bulb moment my mother also has attachment issues and is dissociative.She would flip into a rage whenever I approached her looking for a cuddle for comfort when I had hurt myself and I now realise that she hadn’t flipped she had switched enlightening. This was so beautifully written & really resonated with me, as my own Mother was exactly the same & I was left wanting for love & a safe haven. I can remember her telling me that nobody ever helped her when she needed it, so she had her own issues. I have not repeated the cycle with my own children, but I do have boundary issues where I have done to much for them & been too smothering, I am working on that. Thank you so much for your Blogs, they are a lifeline. Your writing is so helpful both from the professional/logical/CPD level but also personally. It reaches into some of my own material and offers me affirmation & confidence to reach out to others who are hurting. Thank you – keep writing. How inspirational. The number of people you must have helped by sharing your experience and process . You shine a light into dark, difficult, scary places, and you show and share a path that you made. Your writing helps me in my work – and to be a better person. Wow, your blog could have been my emotional narrative. 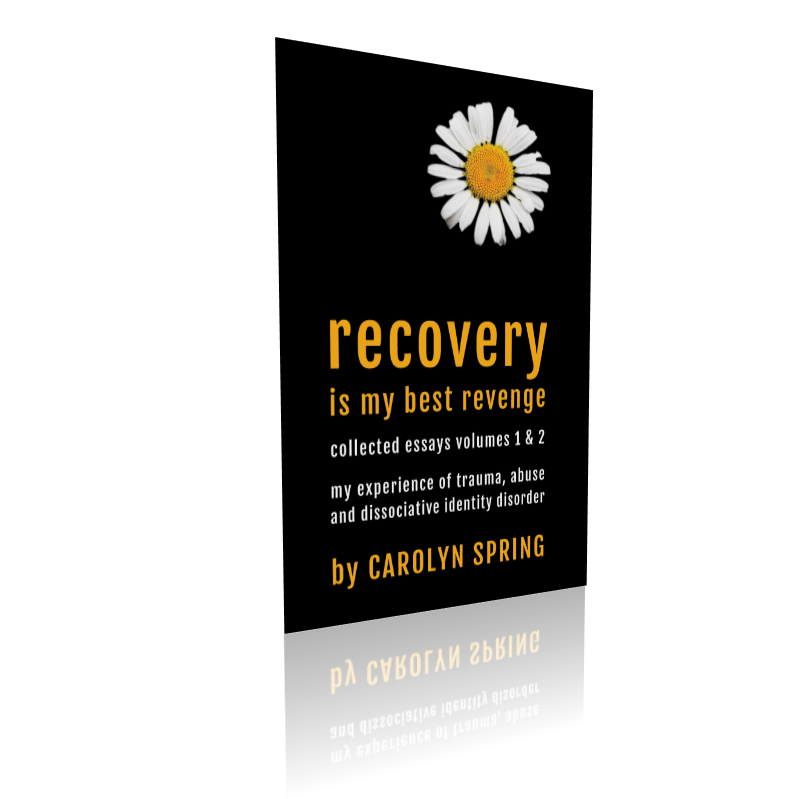 Its never stops amazing me how similar trauma survivors emotional responses are. Today your blog has helped my seed germinate. Thanks. This feels in every way like a page out of my own life. I raged against, and fought, my diagnosis for a very long time. The more I read this blog, the more I can see myself in your story. Thanks for holding up this mirror of solidarity. I’m sure my therapist is thankful as well! I read this and immediately thought how useful this is for me as a therapist and also when I am a client. The idea of therapy being something reduces the overwhelm and is a grounded reality. I love the idea of planting a seed and then knowing there is hope for growth. Beautifully written. I have enjoyed this reading so much, something I am dealing with at the moment. I have a voice for everyone but never for my needs. I had a very absent mother, slept most of her life to cope with her unhappy marriage and life. My father made me responsible for my 3 younger brothers from the age of 6, I was always punished if I ever wanted a little help, cuddle or fun. I had seen a therapist for 7 years to explore my emotional pains, now seeing a osteopath for my physical pain. I am learning how my body still carries my childhood pain, I am letting them go and forgiving them and myself for not loving myself. I can say now that I ‘deserve’ to be loved, supported, looking after and have fun. I am a therapist but I am taking break to give my ‘best self’ to me first. First time in my life, I came to a hotel for 3 days to sleep and rest, just 10 mins from home. I have given permission to me. I have the child in me, all the time but my adult self is fulfilling the child’s needs, only I can do it but I have to ask and voice my needs to my family and friends. No more Shame!! YES!! It is so weird the way your posts seem to keep step with ‘therapy’ me. I struggled to explain my own neediness today. Lost all the thoughts post session, then read your blog and managed to anchor them again. Mega thanks. ‘to put infinite distance between me and this huckster’ love that we can laugh at points! But seriously, I love how you manage to explain everything so well and make others feel less alone. I can always relate to your posts. I would love to say more but I would never manage to express it properly.thank you so much for all you do. You are a star Carolyn! Thank you – this is a really useful piece of insight into your therapy sessions which makes sense for me in my work as a therapist – not everything, not nothing but something; that clients want to trust and yet cannot because they fear being disappointed; acknowledging our limitations as therapists can be secure-making; the shame of neediness. I have taken much inspiration and offer gratitude in return..
Well what can I say? But thank you once again for sharing your journey which travels alongside my own journey and the journeys so many others. It is always timely especially in times of struggling within the stuckness. Thank you for this. Someone said it was “piercingly beautiful,” and I agree. You are, without a doubt, the best writer about dissociative experiences I have encountered (and I have read a lot). On a personal note, your post profoundly resonated with me. It struck me that my younger parts are so filled with fear and shame that they are mostly unable to speak or act in the outside world, so I rarely get beyond the silence or the words of the protector parts. “Hearing” your parts’ responses in that therapeutic moment was incredibly validating in ways I cannot begin to explain to myself or anyone else–just that it felt quite good and a little less “alone-y” which is both terrifying and wonderful at the same time. A bit like a good therapist/therapeutic relationship. Glad! Sometimes I just have to make up words to explain things. Brilliant. I was shown a hole in the plaster where I had tried to get through the wall from my cot into my parents’ bedroom next door, and they were amused. What a wonderful blog to read and very liberating and soothing for all of my parts inner child and man and how life is today – and the enormous amount of unmet needs and suffering I carry has a result of others and of course not myself. Carolyn your writing is hugely impressive full of great gasp moments a stunning way with words – you deserve an award. For the rest of my life in therapy and place in the universe it was great to give freedom that my needs can be met that I won’t be put under hideous oppressive stress just for wanting and needing to be a human being and not just a wonderful absentee. But she’s not a substitute. She’s a prison guard. That is the first conclusion I jump to even before our first session starts. But I am being driven by fear of the unknown; fear of attachment; fear of rejection; fear of being shamed. I’m aware, just about, that I’m not being entirely fair. ‘I’m not seeing a doctor!’ I insisted with a look on my face that was intended to end the debate once and for all. As far as I was concerned, it was simple: I wasn’t going to the hospital, walk-in centre or GP surgery, because I couldn’t go. I couldn’t cope with going. Such was my abject terror that, unless it was a matter of life or death, I avoided all things medical. The problem? This was rapidly becoming a matter of life and death. Dissociative identity disorder is a creative survival mechanism for coping with overwhelming and chronic childhood trauma.